Also referred to as the hydrologic cycle, the natural water balance represents the endless recirculatory transport process that constantly moves water between the earth’s storage reservoirs – the land, the oceans and the atmosphere. Water moves constantly between the reservoirs through the following major processes. Click here to enlarge image. Precipitation is all the moisture that reaches the earth’s surface in the form of rain, snow, sleet and hail. 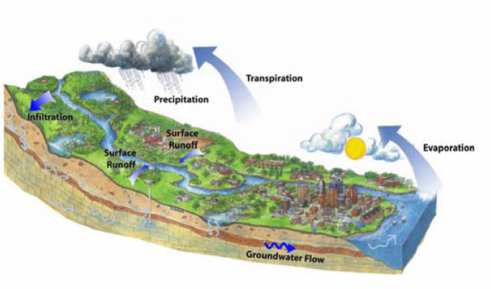 The precipitation reaching the earth’s surface is then dispersed by the three main processes of evapotranspiration, overland runoff, and groundwater infiltration. Groundwater Infiltration describes the movement of rainwater that infiltrates into surficial soils and percolates down through pores and cracks in soil and rock. Water remaining in the shallow soil is taken up by plants while water that percolates deeper may ultimately contribute to groundwater aquifers. Depending on subsurface hydraulic gradients, water can also move upwards or horizontally towards the surface and discharge to a water body as baseflow. Surface Runoff is made up of precipitation and snowmelt in excess of the absorptive capacity of surface soils and the depression storage capacity of the landscape. This excess water flows overland to receiving waterbodies at lower elevations. Surface runoff flows as sheet flow or as accumulated flow in swales, ditches and natural watercourses. The flow pathways of surface runoff are determined largely by the physical geography and topography of the landscape. Evapotranspiration is a term that describes the conversion of liquid water to water vapour through two pathways: evaporation and transpiration. Evaporation occurs when water on plant and soil surfaces absorbs energy and transforms into vapour. Transpiration, which occurs within plants, is the process by which plants release water vapour through their leaves.